After being a kama-ya for thirty-three years, I sometimes feel that I'm nearing my peak and can see a plateau. However, I still have not "ripened" so my life is full of struggles. 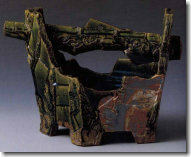 My feelings towards yakimono (pottery) get deeper and deeper and my age is trying to catch up with those emotions. 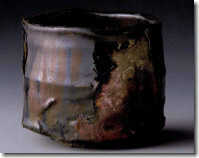 NOTE: A kama-ya is a humble way to refer to oneself as a sort of craftsman potter. Mashiko-based Takauchi Shugo (1937 - ) used to be a salary man -- that's a term that refers to a company employee here in Japan. 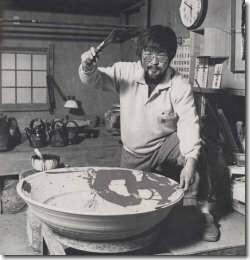 His path in life changed after he visited Mashiko, Tochigi Prefecture, and found the power in Hamada Shoji's work. (For more on Mashiko, click here.) 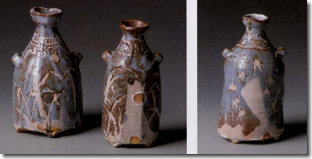 He left the routine life of a salary man and established his kiln in 1968. He's had a tremendous career with a huge following that enjoys his Shino, Oribe, ash-glazed and black creations. 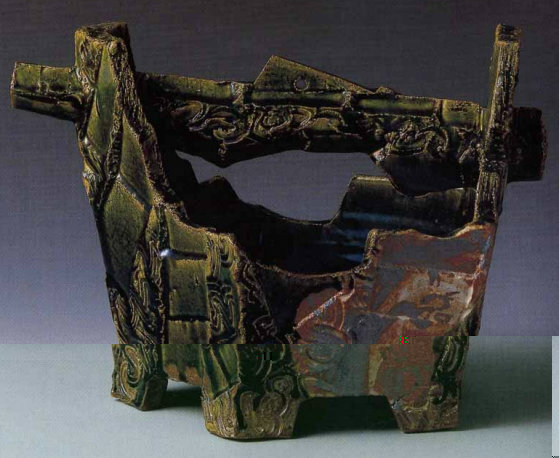 His work is in major museum collections and he was awarded the Tochigi Prefectural Cultural Prize in 1998. 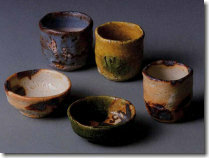 He's featured in the book Japanese Studio Crafts. 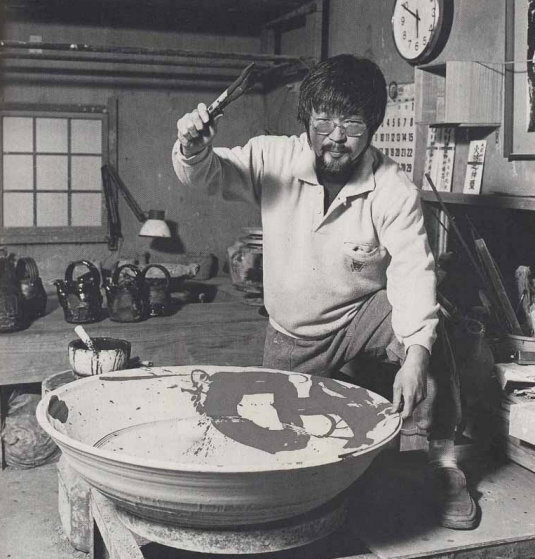 I may also add he was chosen as one of Japan's top 100 potters by three critics in Honoho Geijutsu (issue #30, 1991). What strikes me the hardest in the catalog though is his bold Oribe wares. Here are a few examples. 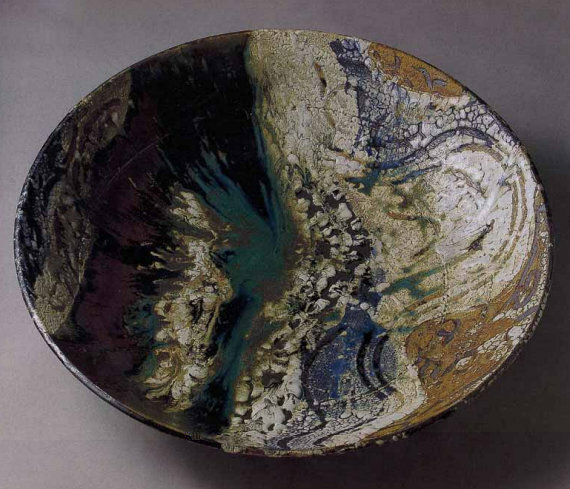 The below Oribe O-zara (large plate) is 93.5 centimeters (36.80 inches) in diameter! 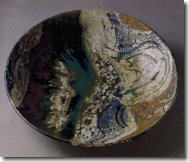 The landscape on the plate is a fierce interaction of glazes.  Takauchi used three here, Oribe, iron, and nuka, and they clash in a harmonious way. The plate is priced at one and a half million yen. 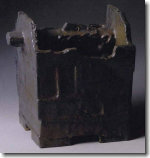 Takauchi is well known for his bucket forms and one is pictured in the book mentioned above. 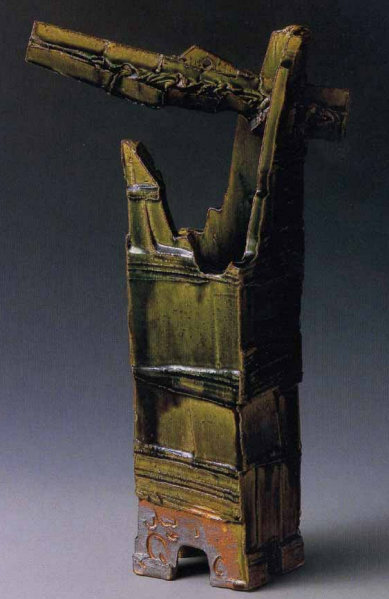 In the exhibition, Takauchi will be showing various take-offs on the form and here (below photo) is a heavy-walled one with a low cut handle. The imposing form has drips near the base and an iron-oxide "window" on the upper third of the three-part body; it's priced at 500,000 yen. 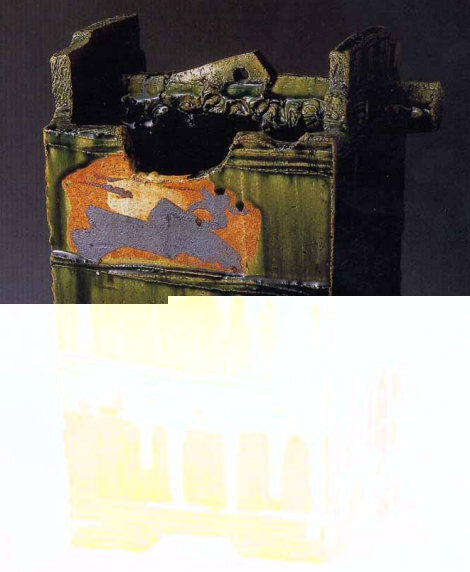 Another take of the bucket is this disconnected handled piece (below) that has added tension between the juxtaposed handle and untouched body. Again Takauchi has broken up the form into parts with his etched on lines. This work is 270,000 yen. 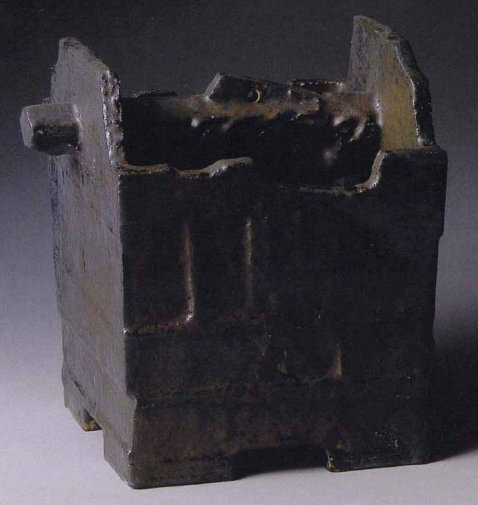 A lower formed bucket has the handle fully attached, stretching out across the body and dominating the piece. My eye initially focused there. Swirling arabesque designs fill some space here, working nicely against the green patches that have been cut in the work. Again, a small "window" on the lower right offers a pleasing contrast to the whole work; 400,000 yen. 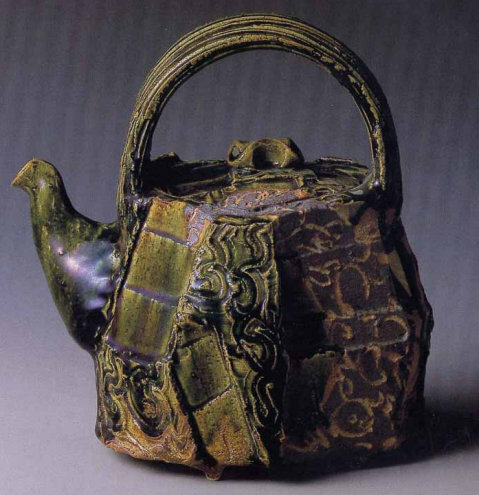 There are many other Oribe works, including handled platters, plates and bowls, and teapots like the one pictured below, 300,000 yen. 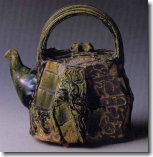 A large Takauchi tea pot was recently posted to japanesepottery.com, and can be viewed by clicking here. 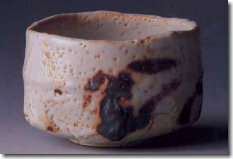 An almost sinister type of Oribe is Takauchi's black-fired Kuro Oribe. The works are gothic in temperament and draw the viewer in with their mystic auras. A single red rose placed within would be a powerful statement indeed, open to endless interpretations. 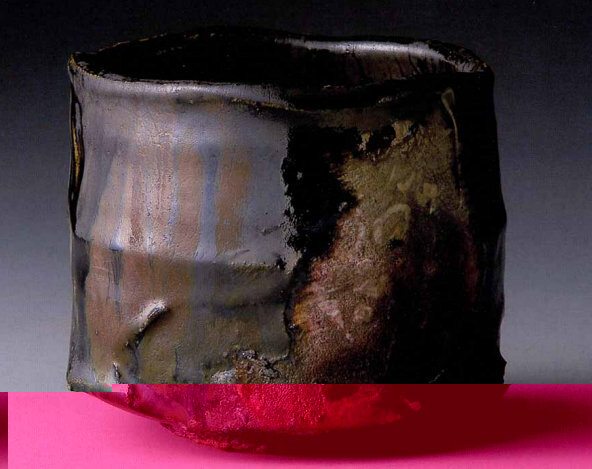 The below piece is priced at 400,000 yen. 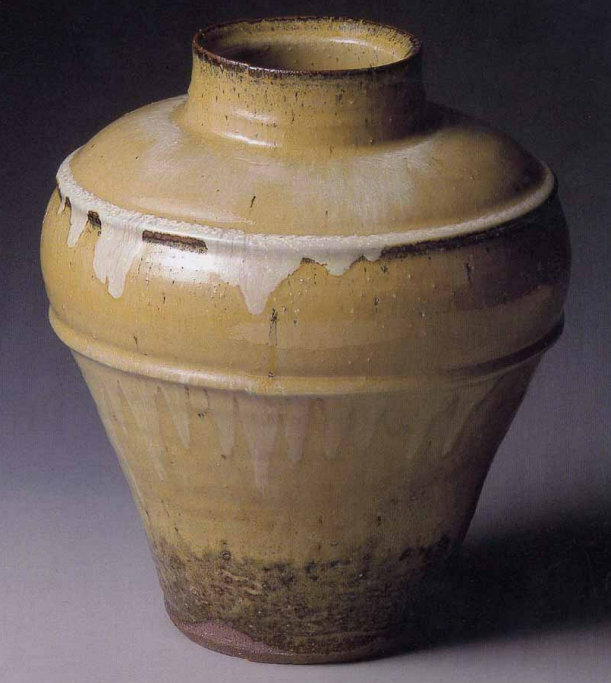 This tsubo (below) reminds me of some of his earlier works using the famous rice-husk nuka glaze -- it's 31.0cm tall and goes for 350,000 yen. 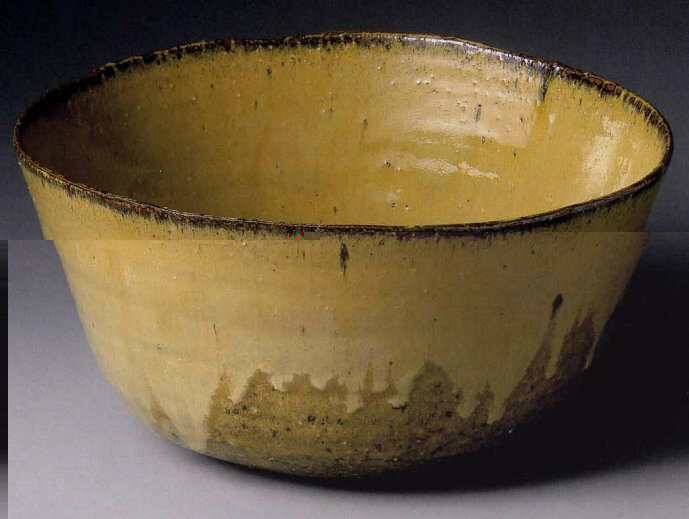 I thought the glaze worked better on his large deep bowls where food would compliment the color; this one (below) is 16.0 centimeters deep and sells for 170,000 yen. 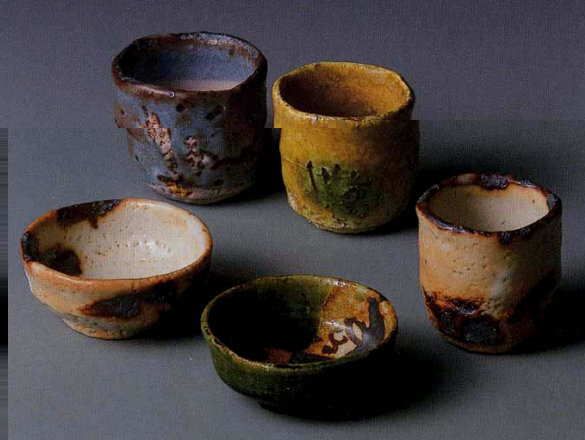 Chawan are also part of Takauchi's output and he's watched his chawan rise and rise in price over the years. Most of them are now a standard 500,000 yen at exhibition. In the catalog there are some Nezumi-Shino, Beni-Shino, Shino (see first photo below), Ki-Seto, Oribe, and the ones I considered the best, his Kuro-Oribe (second photo below). 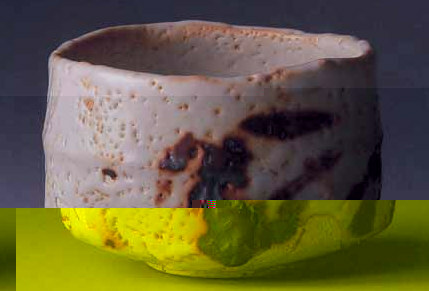 First off I know that whipped green tea in a black chawan is a mystical encounter of color. Takauchi's Kuro-Oribe are taller than the other styles and have a presence absent in the others. 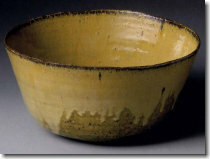 Most chawan are just utensils until they are placed in the context of a Tea room; then they become art. Takauchi's Kuro-Oribe chawan are an exception and sit with an artful dignity unlike most Kuro Oribe in today's poser ceramic world. I didn't care for much of his new Nezumi-Shino designs, as they came off as too busy for me and didn't suit the form well, as seen on these tokkuri -- all are 100,000 yen. 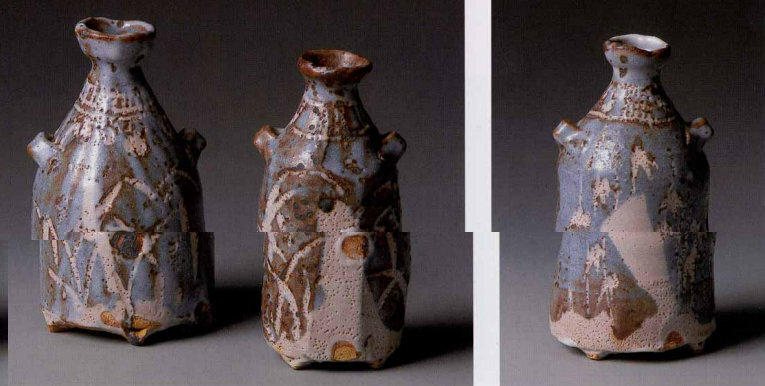 A fun touch to the exhibition is this set of five different guinomi (Nezumi-Shino, Ki-Seto, open-faced Shino, Shino, and Oribe) going for the same as the tokkuri. I thought it might be nice to give you a preview of the Takauchi exhibition like us folks here have. I know that many collectors are calling the gallery right now asking to reserve works pictured. All in all there are fifty-four works in the catalog and in total there will be more than a hundred on display. I hope to get there before they're all sold out. To learn more about MINO ware, click here.